(Quote) By Ramana Maharshi – WHO A I? What is called the world is only thought. ~ Who Am I? “Who looks outside dreams; who looks inside awakens. “Even though the reality of the Self has been stated in many ways, it remains untold. The self is known only by actual Experience. That Experiential Awareness of the Self is prevented by the mind due to the firmly established conviction that “I am the body, ego/mind”. MAKING SENSE OF CONSCIOUSNESS. Part 1. When reading any of this material you are best advised to look to the implied meaning of emphasised words and not merely read the word as it is used in common speech. Mysticism has always demanded penetrative insight – almost out of perversity – to goad the enquirer to look deeper. It therefore takes a little time and application to understand how the term Consciousness is used in mysticism, particularly if this is unfamiliar territory. You are advised to forget what the term has come to mean in neuroscience, medicine and psychology and in modern parlance that assumes a complicity in superficial philosophical view. In Mysticism the word Consciousness has a more elusive and far more profound meaning and in respectful deference to all Mystics, they did get there first. The nature of Consciousness as the term is used in mysticism is not an idea that can be grasped merely by reading an article or even a book or two. It is a concept informed and corroborated by experience that has to be harvested over many years – a concept that eventually penetrates everything we think we know. Neither is its nature a question of opinion or belief in something that might place it in the realm of religious doctrine. It (Spirit) exists independent of the existence of any animated life form or meme. Consciousness, as realised by mystics, is a fundamental aspect of the cosmic matrix, as real as the material that forms the universe. It is not an imagined Idea. This is not intended to sound like fundamentalism though I accept that at first it may do so. If you have the time to read and reflect on the content of this blog, it will become apparent that the way Consciousness is defined in mysticism dramatically alters the way we perceive life. When we fully integrate this concept into our notion of existence it impacts on everything. It does this by profoundly reorganising our Conceptual Hierarchy forcing us to re-examine ideas modern society considers primary and inviolably sacred and yet which are, when seen from a metaphysical point of view, actually spurious. The Mystic (and the Yogi) eventually comes to live in an entirely different and unconventional conceptual reality; one that manifests what we all desire – a deep sense of happiness and well-being. We each seek this gem even if we are not aware that it drives us. Worldly desires are the carrot dangling on a stick that we fruitlessly chase in pursuit of enduring happiness and contentment until it occurs to us to ask, “Who is holding the stick”. Were that not so then all these words would be so much idle rhetoric. It would though, be naïve to presume that we could all suddenly be happy simply by adopting an idea that sages have pondered for centuries. What most of us do not realise is that we have been duped, even brainwashed, by the prevailing ignorance of a sophisticated yet Spiritually bankrupt society into a way of thinking about life that ensures that an enduring experience of happiness and well-being is actually impossible. In 21C society, rationalism, and its bedfellow Atheism, dominates as the prevailing mindset; a mindset that considers Spiritual Intuition as archaic and irrelevant in the search for answers to the mystery that presents as Existence. This is largely because Spirituality is seen as being synonymous with a Religious Belief when religious belief is a social phenomenon and another thing entirely. We have learned to be extremely mistrusting of subjective experiences as being wholly unreliable as a basis on which to construct theories that challenge this normality even to the extent that we label them illness or psychosis when in fact they are often glimpses of a Spiritual Reality. ‘Enlightenment’, Swami Bawra once told me, ‘is mastered madness’. To walk the path is to walk a knife edge and any peace manifested this way does not materialise through feint endeavour. It seems to me fundamental that we learn to recognise the difference between Delusions (or in extreme cases Spiritual Psychosis) and Stable Insight if we are ever to navigate what is a very mysterious ocean. It has always been something of a mystery to me that in its search for an explanation for Consciousness contemporary researchers focus on the Illusory Effect (the complex activities of Mind) and ignore as being irrelevant any explanations for the origins of Consciousness offered by mystics, choosing to see any insight they can offer as being merely Religious and rooted in blind faith. This is a position informed by a lamentable lack of Profound Understanding. 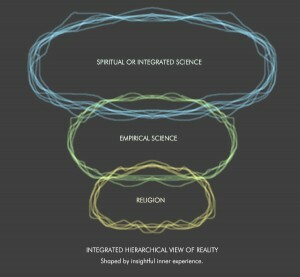 If we really wish to understand the nature of Consciousness we have to set aside our empirical criteria for investigation and accept that our body and mind must become the laboratory and in faith accept that Subjective Experience will finally deliver the singular insight (Knowledge from whence all else proceeds) that is Reality – Consciousness. Long before scientific rationalism dominated our thinking Mystics observed that Consciousness did not originate in the brain; rather that the brain is a kind of port through which Consciousness, with its own unique properties, shines and in doing so gives rise to self awareness and the phenomenon that is animated life and in a material component (Nature) that is otherwise inanimate and insentient. The first of these diagrams is the empirical version that yields only unresolved complexity. It offers beguiling explanations but not truths. 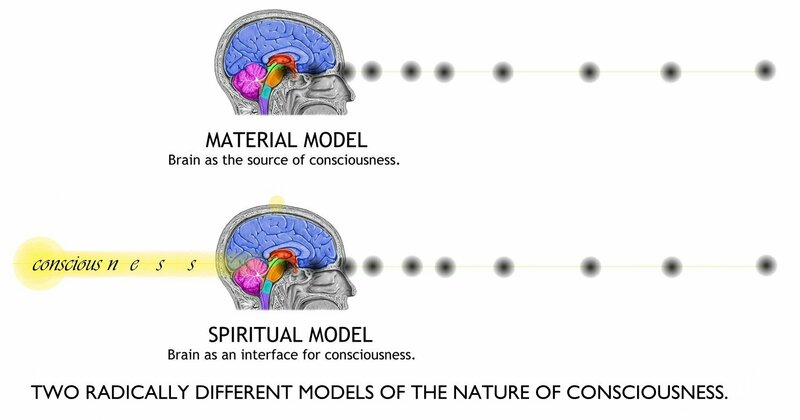 The second depicts the mystical view, which is that Consciousness itself is immaterial in every sense and not generated by the biology we take to be ‘us’ as thinking beings but rather causes that biology to manifest thinking beings. From this singular understanding proceed more complex models and concepts. Without this insight ideas are merely bits of discordant information floating unrelated in an endless void – ideas only as profound as our personal ability at intelligent complex thought. Intellectually brilliant but fundamentally flawed. The property of Insight, (as distinct from learned academic material) is distinct in that what is revealed is not personal – it is not MY knowledge. It is there to be Seen by anyone who can look without Egocentric interference. Hence the term Seer. One who Sees Essential Knowledge. The ability to observe this phenomenon takes years of single minded practice but it is not impossible and neither is it pointless. Mastering this process is not for nothing; it has a pay-off that is so profound that it is spoken of with deep reverence. In resolving this conundrum we come to experience an enduring state of sublime happiness, or bliss, (our true nature) that is so profound that it eradicates all suffering by bringing the struggling illusory Mind to complete stillness. Millions have touched this state by accident and have failed to appreciate the profound nature of the experience. But even without understanding, the experience changes everything for the individual. Where it is fleeting we will speak about it for the rest of our lives as a moment when we touched everything; understood everything; even merged with God. Where it is prolonged and without mastery it brings a peculiar kind of madness and a unique kind of suffering. Understanding this process and its implications sets us right. According to mysticism realising the true origin of Consciousness is actually the pinnacle of human endeavour because Consciousness is what I Am. If there is a goal to be reached it cannot be permanent. The goal must already be there. We seek to reach the goal with the ego, but the goal exists before the ego. What is in the goal is even prior to our birth, that is, to the birth of the ego. Because we exist the ego appears to exist too. If we look on the Self as the ego then we become the ego, if as the mind we become the mind, if as the body we become the body. It is the thought which builds up sheaths in so many ways. The shadow on the water is found to be shaking. Can anyone stop the shaking of the shadow? If it would cease to shake you would not notice the water but only the light. Similarly take no notice of the ego and its activities, but see only the light behind. The ego is the thought `I’. The true `I’ is the Self. Q: If it is just a question of giving up ideas then it is only one step to realization. A: Realization is already there. The state free from thoughts is the only real state. There is no such action as realization. Is there anyone who is not realizing the Self ? Does anyone deny his own existence? Speaking of realization, it implies two selves – the one to realize, the other to be realized. What is not already realized is sought to be realized. Once we admit our existence, how is it that we do not know our Self? The conundrum posed by our existence is one that has challenged humanity’s best thinkers for millennia. Our conviction at having alighted on ‘the truth’ has provided us with endless hours of debate, inflamed our deepest passions and even divided whole nations and nations from nations, and it continues to do so. Imaginative stories handed down through generations and our wild speculations have determined the path humanity has carved through time, and millions have died defending a ‘truth’ that has later turned out to be false. Myths, it could be said, are merely our truths that have fallen from grace. What is abundantly clear is that humanity is on a long and complex evolutionary journey. Not so much a physical one, (though that is also true) but a conceptual one that has brought us to a critical point in our understanding of the nature of existence. It does not take a genius to observe that humanity for all its technological development is ideologically unintegrated, and some would say hopelessly so. If we are beings with a Spiritual essence and are not just accretions of stardust then at some level we are united in our differences but on a psychological level our egocentric tendency to want to establish and reinforce our differences at any cost, rather than find that one idea that might unite us all, is tragic and tearing us apart. Opinions now differ radically as to whether the cause of this human conflict is religious or due to the emergence of scientific reductionism or just down to plain old human nature. The one thing we can be certain about is that the divide is enormous and the gap not inclined to close any time soon unless there is a paradigm shift in our thinking. What is also certain is that conceptually there is no going back, though there are many who wish that we could. When religions compete with science as they have done for centuries now, science has the whip hand. Humanity has invested a huge amount of time and energy in technological development and to understanding the nature of material reality but its understanding of a Subtle Nature beyond material existence is still entrenched and shockingly naïve. Questions posed by much respected academics within the scientific community as to the nature of consciousness, to pick one instance, presume it to be a material phenomenon when there is a significant body of knowledge in existence to suggest that it is not. If the questions we pose have already eliminated the sphere where the correct answer may be found then we will remain trapped in ignorance. “What about?” she would challenge. Contemplating how life works on a subtle level, meditation if you wish, is often seen as a rather indulgent and selfish activity that does not contribute much to the ebb and flow of society itself, but the paucity of our understanding on this level directly impacts on the choices we make and the future we forge. The rudder of our society may be awash with academic brilliance but it is short on the wisdom that emerges from this supposedly indulgent activity to the extent that the direction we steer is often completely counter to what would be best for the long term whole. A very long time ago when the population of Earth was relatively small it did not matter too much what we thought about the mechanics of reality but now, as we stand on the brink of a global environmental crisis and perhaps even the perfect storm, it really does. We are all being asked to reflect on the nature of our desires. If we can no longer afford to want the material objects that have so charmed us for a century, then what? The ascendency of the philosophy of despair that has emerged out of Scientific Reductionism; ‘life has no meaning beyond what we see’; ‘Success can only be measured by how we dominate others who are weaker,’ runs counter to what most of us want to believe. Even if we do not understand, we cling to the notion that life has a subtler purpose or that things are meant to be. Well does it have a purpose and is there a principle that orders meant to be out of chaos? And that is not all. The implication is implicit in the statement. As a product of nature we are bound to the certainty of change and ultimately that process of change leads to our demise. Since we can do nothing about this inevitability it is not possible to eradicate physical, or emotional or intellectual suffering except through a modification of our perception. At one time religions completely dominated the, ‘what is existence’ debate. Within Christianity, ideas that challenged the dogma of the period were met with violent opposition and repression. Heresy was once a crime punishable by death. The injustices that were carried out in the name of God are legion and very well documented so there is no necessity to dwell on them here. Even so, even in the near distant past, it was still extremely difficult for scientists as individuals to be objective and to disengage their ideas from the notion of the existence of God and when discoveries emerged to challenge the dogma of the day, even as recent as Darwinism, it often produced tremendous conflict both personal and social. In defending notions held to be ‘The Word of God’ but that were clearly out of accord with the emerging empirical evidence of the day, as free thinkers prised open nature’s underbelly, the authority of the Christian church was gradually eroded until Christianity became a shadow of its former self and as such was unable to guide the rising star that was to become Reductionist Science that would then go on to become the platform for the now expanding Atheistic view of the status quo (those collective bodies that determine the policies that seek to shape our lives) that prevails today. Religious fundamentalism may appear to be on the rise but I would risk stating that its days are numbered and not because atheism is going to sweep the planet. Creative imagination will always challenge ideological entrenchment and it was only a matter of time before our Creative Intelligence outwitted blind faith and the religious hysteria that is mistaken for spiritual experience. It is no longer an either/or choice of Religious Dogma or Scientific Rationalism. Dogmatic science masquerading as truth is no better than dogmatic religion masquerading as truth. 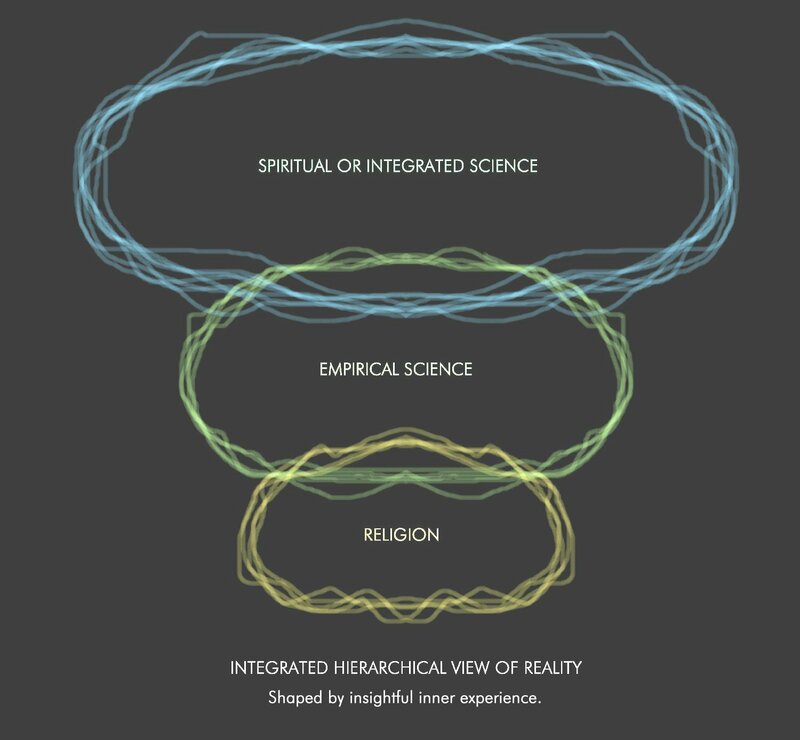 The alternative view is one that sees the development of conceptualisation as hierarchical – first Religious Dogma, then Scientific Rationalism, then Integrated Science or as some would have it Noetic Science. It is a model that proposes that matter is orchestrated by an Intelligent Principle that is not material in nature and which produces a symphony from inert matter that appears life filled or animated – a cosmic drama of such immense beauty and complexity that it inspires awe in every sense of the word. (Thoughts) THOUGHT FOR THE DAY.